"Can catch up to 35,000 flies, horseflies, deer flies, and gnats before it needs attending to." "For a few dollars, it can make your outdoor event a pest-free experience." "Looks good on your countertop while clearing your indoor room of those tiny germ carriers." "Relatively innocuous in its style so it can be tucked behind a plant on a table." "Adheres to any glass, wood, metal, or plastic surface." "Attracts thousands of flies that may otherwise be resistant to bait in standard bags." "Quietly attracts flies, gnats and fruit flies with its UV light and scented glue board." "Slathered with a non-toxic formula that is designed to lure big, biting insect beasts." This fly trap is favored by reviewers for its volume and effectiveness in catching a slew of flying insect species. The Starbar Fly Terminator Pro can catch up to 35,000 flies, horseflies, deer flies and gnats before it needs attending to. This is a serious fly trap that is designed to be used outdoors. It has a heavy odor that can be unpleasant to pets and small children who may get close to it. Install it close to where you have the most issues, such as by a backdoor or in the corner of a small yard. Just don't rest it close to a wall or it will fill with cockroaches and other creepy crawlies who are drawn to its significant odor. Read more reviews of the best roach traps available to purchase online. Spending money on a fly trap is usually not a top priority. That's why this top pick has so many stellar reviews—it can eliminate up to 20,000 flies, is sanitary, and comes at a bargain of a price. Just hang these traps in your backyard, add water, and watch them flock to this attractant. No poisons are used in this so they are safe around pets and kids but they do produce a strong odor. When the trap is full just toss it (without coming into contact with the dead flies) and you are done. What more can you ask for? Attractive and effective, the FlyFix Fruit Trap looks good on your countertop while clearing your indoor room of those tiny germ carriers. It comes in four colors that can blend into your home décor while attracting fruit flies through a narrow funnel and into the FlyFix hollow core. The tiny globe uses a small piece of fruit of your choice and some water under its crystal-like top to lure flying pests. Lock it in place and set it out to rid your rooms of flitting fruit flies. It can rest neatly in a bowl of fruit to grab fruit flies at their home base or be placed neatly on a kitchen countertop. FlyFix comes in a three-pack of jewel-toned colored orbs so you can spread them around the home to catch any critters that have traveled beyond the kitchen. The Victor Fly Magnet is a tidy container that uses a non-toxic bait to lure flies under its tented lid and into the depths of its glass chamber. The flies drown in the jar, which can hold hundreds of winged insects. Bees and wasps are repelled by the scent of this compact outdoor fly trap, too. Small and white, the Victor Fly Magnet Fly Trap is relatively innocuous in its style so it can be tucked behind a plant on a table or set on a porch under a chair to keep flies from ruining your outdoor experience. The bait squares are made of dehydrated food-grade products, and you'll need to cover them in water to activate the trap. Once the jar is full of flies, which should take at least a week for typical outdoor environments. When it is full you'll just toss the contents and activate another bait square. The Catchmaster Clear Window Traps are non-toxic and easy to install. They come in a handy four pack and adhere to any glass, wood, metal, or plastic surface. They work best in windows, which naturally attract flies of all species. The sticky substance is laced with a scented lure that flies can’t resist. Once the clear rectangle of film is full of fruit and house flies, gently pull it away from the window and replace with a fresh one. The sticky substance left behind from the adhesive is easily removed with a swipe of rubbing alcohol. If you've got a serious fly problem outdoors this trap is the one for you. Great for barns, houses with chickens, and more this trap can house thousands of flies and doesn't need to be changed for 30 days. Like most traps on this list, it is pesticide free and you don't need to touch any of the dead flies to when you throw it out. 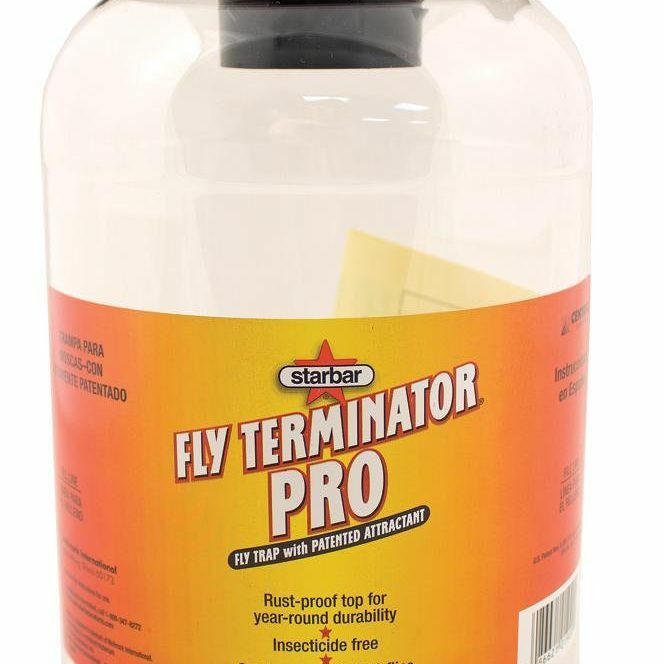 Reviewers give this top marks for eradicating serious fly problems in a short amount of time. One reviewer commented that their dog liked the smell of the attractant so be sure to hang it out of reach of children and pets. The days of loud pops and electric snaps as flying insects fall to their demise at the bottom of a bulky electric bug zapper are over. Discreet, slim and attractive, this indoor and small outdoor unit lures small flying insects into its sticky chamber never to be heard from again. The Hoont Wall Sconce Sticky Fly Trap Killer quietly attracts flies, gnats and fruit flies with its UV light and scented glue board. The glue boards that are attached to the inside of this machine can be removed and replaced easily every week or as needed. Reviewers bought this for its non-toxic, odorless pest control that took care of flies as well as winged beetles, gnats and other small airborne pests in small spaces. If mosquitos are also getting in your way, check out our guide to the best mosquito traps you can buy today. Biting horse, deer, and yellow flies can ruin a backyard barbecue or make working in the yard a painful experience. The Bug Ball baits those biting bugs to their sticky demise. The 18-inch ball is made of PVC and slathered with a non-toxic formula that is designed to lure big, biting insect beasts. The balls are weather resistant. Reviewers found that the buoyant ball stood up to high winds and rain when secured properly and continued to attract horse flies and other winged insect beasts. The drawback is that the ball requires some work to set up. It comes with needles to inflate the ball as well as a suction cup and loop for hanging. The smelly liquid that lures the horse or yellow flies that you need to coat the ball with is sold separately. Once it’s inflated, apply the lure, such as Tangle Trap Sticky Coating. Users like that they can use their own bait on the Bug Ball, however, it works best with the viscous commercial food-grade fly bait than DIY baits that can be significantly thinner. Want to get rid of other uninvited guests? Take a look at our selection of the best mouse traps. Our writers spent 12 hours researching the most popular fly traps on the market. Before making their final recommendations, they considered 10 different fly traps overall, screened options from 12 different brands and manufacturers, and tested 5 of the fly traps themselves. All of this research adds up to recommendations you can trust.